"This alert was based on a NEAR MISS INCIDENT wherein a piece of concrete fell from a height of about approximately 50 ft (15m) and hit a worker below. 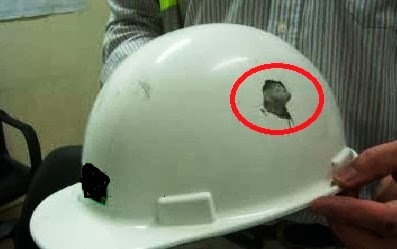 The worker was wearing a hard hat at that time, otherwise it could have resulted to serious injury or even death. The size of the piece of concrete which fell was around the same size of a plumb stone and actually embedded itself on the side of the hard hat". This incident illustrates the importance of wearing a hard hat and how serious the impact of not carrying out proper housekeeping can be. The average of a SAFETY HARD HAT weighs about 14 oz. The average man's head weighs 14 lbs. So there's an ounce of safety for every pound of head - provided the head protection is properly worn and maintained. Hard hats not only reduce the chances of serious injury resulting from falling objects, but it protects you also when you bump your head on things like machineries, ductworks, ceiling tie wires and forms. Non-conductive hard hats protect you from electrical shock and burns. Make sure that your hard hat is the right one to your job and MUST WEAR IT! THERE WILL BE NO HELP UNLESS YOU WEAR IT. The hard hat is a very useful piece of safety equipment. Don't take chances - wear your hard hat at all times, it protects your head and brain as well. Keep your hard hat always clean, in good condition and replace it immediately if it is damaged. In case a head injury occurred, report immediately to your supervisor. Properly adjust suspension systems to maintain clearance between your head and the shell of the hat. Don't cut holes for the purpose of ventilation. Don't substitute a "bump cap". They are not strong enough. Don't paint your hard hat. Don't put anything under it such as cigarettes, notebooks and the likes, except your head. Don't wear it on a backward style. "It's too heavy" - Hard hats are only a few ounces heavier than a cloth cap - the extra protection you get is worth the extra weight. "It's too hot" - Measurements taken in hot weather show that the temperature under a hard hot often is cooler than it is outside. "It gives me headache" - A thump on the head from something which was fallen from 2nd level floor will give you more even worse. There is no medical reason why a properly adjusted hard hat can cause a headache. Don't alter the suspension system or the hard hat as you won't get the desired or designed protection. "It won't stay on" - You're right, it won't - in a high wind. A chin strap will solve the problem. Otherwise, you will find that a hard hat stays put no matter how much stooping or bending you have to do - if it's fitted properly. "It's noisy" - That's your imagination. Tests shows that properly worn hard hats will shield your ears from noise to some extent. "Don't be a hard headed - Get in the hard hat habit".